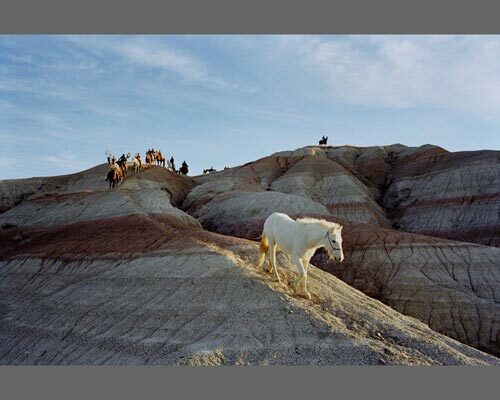 The Oomaka Tokatakiya is a nearly 300-mile memorial horseback ride across South Dakota in the United States. The ride starts on December 15th, at the site where the Lakota Indian Chief Sitting Bull was killed, and traces the trail taken by some of his tribe to join Chief Big Foot. It goes on to follow Big Foot's effort to reach Chief Red Cloud in Pine Ridge. And ends on the December 29th at the site where the Wounded Knee Massacre took hundreds of truly innocent lives in 1890. One hundred years after the massacre, the Lakota performed a Wiping of the Tears Ceremony to signify the end of mourning. And in 1990, after tracing the trail for four years, the ride was meant to end. But in 1992 the ride was restarted and aimed squarely at the future. While the ride is still in homage to Sitting Bull, Big Foot and those who lost their lives at Wounded Knee, the ride is also meant as a cultural embrace to foster leadership qualities in the youth. Along the way, the riders experience some of what their ancestors endured by embodying an intellectual, spiritual, and physical remembrance. Braving the brutal South Dakota winters, these kids, as young as seven, ride up to 35 miles in a day. TC Hill, Sandy Frank, Joshua Hale, Ica Ducheneaux, and Joseph Looking Horse. This project was partially funded through grants from the Society for Photographic Education, the Sidney Stern Memorial Trust, and the California Community Foundation.